1) Success is cultivated consciously, through deliberate, daily choices about where to focus one’s attention and energy. 2) Enjoying the practice of swimming as a life-long path of mastery and flow is as valuable as achieving any end goal. That said, these two philosophies linked together synergistically, motivating Terry to pursue “peak performance” and “flow states” as a daily habit in his swimming life. 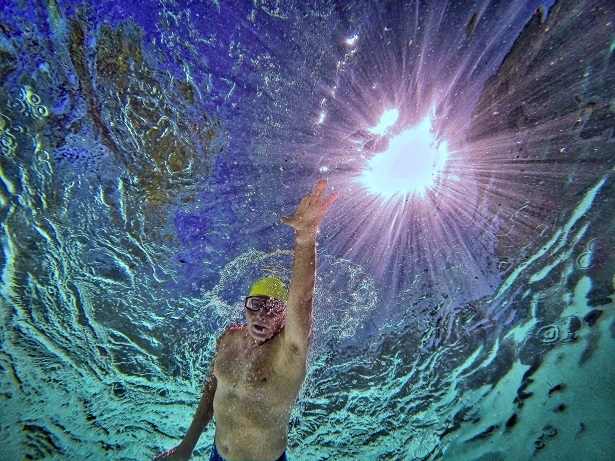 Whether setting an intention that each practice session be “the best swim of my life,” reading voraciously on any relevant new research, or tirelessly seeking to simplify and refine the most elegant and efficient method of teaching swimming, this underlying credo deeply informed Terry’s life and his mission with T.I. It shouldn’t be surprising, then, that even the early years of Total Immersion were shaped by Terry’s understanding of the importance of conscious and strategic goal-setting. This week, we’ve reached deep into Terry’s archives to pull material from his “Swimmer’s Bible,” a self-published booklet he wrote and sold in 1991, just 2 years after Total Immersion was founded. This document exists only as a hard copy from Terry’s personal library (perhaps some early alumni have tattered copies) and has never been published online until now– he wrote it before the internet existed! Though T.I. was still in its infancy when it was published in ’91 (5 years before his best-selling Simon & Schuster book), Terry had already been coaching elite age-group and college swimmers for nearly 20 years and had achieved considerable success, developing 24 national champions between 1973 and 1988. 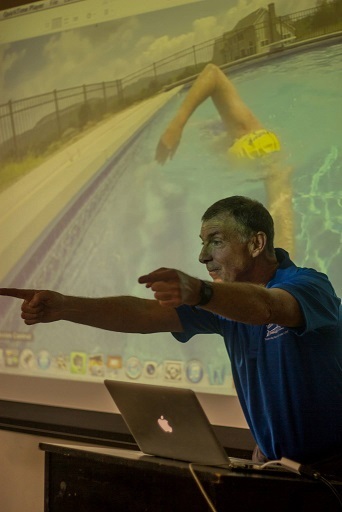 Terry’s primary aim with the “Swimmer’s Bible” was to share with average adult swimmers the same successful strategies that he had employed with the accomplished swimmers he had coached at the highest levels of elite competition. The following excerpt on goal-setting is the opening section of the “Swimmer’s Bible”– the fact that goal-setting was the introduction to his first guidebook to swimming is not incidental, but completely fundamental to his approach. 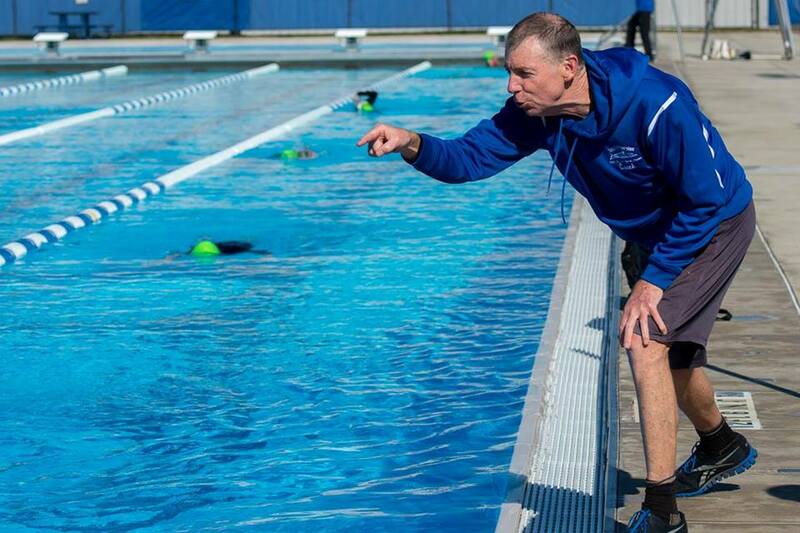 He recognized, from years of successfully coaching high-level athletes, that how one thinks about one’s swimming is integral to how one performs. This understanding is a philosophical thread that connects the founding years of Total Immersion to its current incarnation, and his guidance from 1991 is as practical and effective now as it was then. Enjoy… and Happy Laps! Success strategies to get whatever you want out of swimming! Success, particularly in training for athletic performance, is not the result of luck, but the predictable outcome of planning, concentration, and cultivating the basic talent we all have. No great success is ever achieved without great commitment. Your swimming can and should provide you with results that are deeply satisfying, and renew your enthusiasm, ensuring your long-term involvement. This could be anything from setting a world Masters record to simply swimming for peak mental, physical, and emotional health. You can achieve all your goals, but it won’t happen by accident. You need a success system, and we have one for you. Have a well-defined goal that really matters. Believe totally that you have the resources and capabilities to achieve that goal. Develop a strategy or plan for achieving your goal. Execute that strategy with purposeful, effective, and consistent actions. Monitor your progress and learn from your experience in pursuit of your goal. Adjust your plan as necessary to reach your goal. Competitive Swimmers: Clearly, the answer is yes; those who define the outcomes they want to achieve greatly increase their chances of obtaining them. Goals engender passion, give power and meaning to what you do, strengthen your resolve to adhere to a training schedule, make a tight interval, do a drill correctly, etc. when your will is weak. Fitness Swimmers: Yes. Nearly 70% of all Masters swimmers never compete, but they all attend workouts for good reasons: fitness, weight control, stress relief, etc. Swimming for health and enjoyment is no less important than training for competition. Doing anything without some sort of purpose eventually becomes dull, boring, and repetitive. If you allow that to happen, you’ve defeated your original purpose. Therefore, it is important to express your purpose for swimming, then set goals that will help you achieve it. Professionals in the field of motivation and achievement believe strongly that the development and ultimate accomplishment of goals begins with a vision, and that the more vivid and specific that vision is, the better the chance of a successful outcome. List your goals. Limit to 5 or fewer to sharpen your focus and force yourself to prioritize. State them in positive terms. Describe them in specific and sensory-rich language– what, when, where, why, and how. Impose deadlines and time-frames. Write a paragraph on why each goal has value. Describe how you will benefit from reaching your goals, what you will risk by not reaching them. Your goals should be challenging but realistic. They should have sufficient value and immediacy to carry you through difficulties, to inspire you to passion and extraordinary efforts when needed, but more importantly, to energize and reinforce you for consistent, persistent use of your resources day-in, day-out. Inventory your strengths and capabilities, your resource to get the job done. You can do this best by recalling several past successes and capabilities that made them possible. Identify resources and capabilities that you must acquire, develop, and improve to reach your goal. What has kept you from reaching this goal in the past? Develop an unshakeable faith that you can and will reach your goal. Belief is a catalyst for taking action– the biggest difference between success and failure. If you were guaranteed success, what actions would you undertake right now? As recommended above, remember your past successes and see them in your mind as if they were happening now. Live and breathe the success of the past and project it into the present. Then use that to create a vivid mental image of your goal as reality right now. Experience your outcome on a daily basis, as being already true. Martial arts guru Bruce Lee said that 10 minutes of workout with mind and body completely focused is more valuable than 10 hours of going through the motions. How to do it? For adult athletes with limited training time: precise, effective, goal-oriented use of that time is critical. Focus on 2-3 closely related events (in either stroke or distance), identify the capacities needed to perform well in them, and use the information acquired here at camp to plan a training program that devotes the bulk of your time and energy to enhancing those capacities. Minimize time spent on anything that does not directly enhance your chances of reaching your goal. To assist in your planning process, consider finding a role model who is achieving what you want to [achieve]. Ask them to identify the critical abilities, attitudes, and training habits that permit them to perform as you would like to. Work at developing the same traits and habits. Actions to take– what, how, and when you must do. Beliefs to cultivate– affirmations and thought patterns. Schedules needed– daily, weekly, and a total span. Commit to purposeful activity directed at achieving goals that contribute to the mission! Do something purposeful each day to reach your goal. Even if you have no workout scheduled, you can still review your log book, refine a training schedule, or seek information that will improve your preparation. Begin immediately. Even the greatest journey must begin with one small step, and nothing happens until you take it. Once your goal is set, don’t wait until your plan or conditions are ideal. Even if your plan is incomplete, it is important to take that first step, to be action-oriented. Have confidence that you can adjust and improve your plan as you go through experience and increased understanding. Review your actions critically each day and evaluate what you have done to advance towards your goal. Compare actions and outcomes to the requirements of your goal. Be willing to make adjustments as you learn more. Examine your continuing motivation and commitment. Everything happens for a reason and a purpose, and it serves them. They think in terms of possibilities and benefits, though those may not always be immediately apparent. Failure is an emotionally-charged concept which they do not entertain. There are only results– some successful, others are opportunities for learning experiences which improve chances for ultimate success. The best way to measure the effectiveness of your personal training program is to keep a detailed diary or log book of practices and meets [or races]. Over time, the information collected will reveal successful patterns in your training, and make future planning a more educated process. Peak performers exhibit the flexibility/adaptability to change direction when necessary and find more effective methods– the mental agility to balance the competing demands of work, family, and training. When a training program leaves you feeling flat and stale rather than strong and sharp, when a race brings poor results, when a taper isn’t working– get more information, understand why, consider alternatives, don’t be complacent. You may simply need to consult with someone– a coach or another swimmer– who can take a more objective or informed view of your situation. Then be willing to try something new. Even failed plans have value because, by eliminating what doesn’t work, they help narrow the path to ultimate success. “Psyching out” in competition can undermine the world’s greatest training program because physical skills and great conditioning are no match for self-doubt and nervousness. Sports psychologist Dr. Jim Loehr, author of the book Mentally Tough, says that the mental game of handling competitive stress can be taught just as systematically as a good stroke, and mental muscles [can be] conditioned just as predictably as your physical ones. The most important trait for sports success is the ability to shut out stress, doubt, and distraction, and concentrate on the job at hand. Mental toughness, as Loehr calls it, means staying in a calm, focused state. Negative thoughts cause physiological reactions: increased heart rate, muscle tightness, shortness of breath, and reduced blood flow. Pre-race anxiety can even increase blood lactate levels. Positive emotions (Loehr’s “Ideal Performance State”– an internal feeling of high arousal combined with a profound sense of calmness, clarity, and control) produce desirable physiological reactions: greater muscle flexibility and increased endurance. What can you do at meets [or races] to minimize anxiety and maximize calmness and confidence? Project confidence even when you don’t feel it– “lying with your body,” as Loehr calls it. Anthony Robbins, author of Unlimited Power, says you can overcome fear and uncertainty by projecting energy, confidence, strength, and joy in your posture, voice, and mental state. Such actions can actually produce a shift in your emotions. Enjoy yourself. Sure, competition can be stressful, but racing is your most direct opportunity to reap the rewards of your training. So, mount the block [or enter the water] with eagerness, not dread. When you have long waits between races, don’t sit around contemplating the next race– move around, make friends, socialize, stay loose. “In any kind of performance, we’ve found that the more you enjoy what you’re doing, the more all the other qualities fall into place,” says Loehr. To shut out doubt and distractions just before the race, concentrate on one, well-focused technical point that will help you execute better. A gentle warmup just before your race can also be very effective in calming your nerves and getting focused on what you can do to cultivate a swim that feels great.